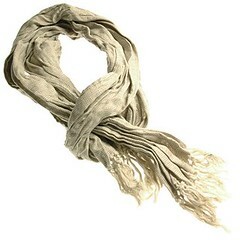 Haute couture scarves are another exciting option available for the fashionable. 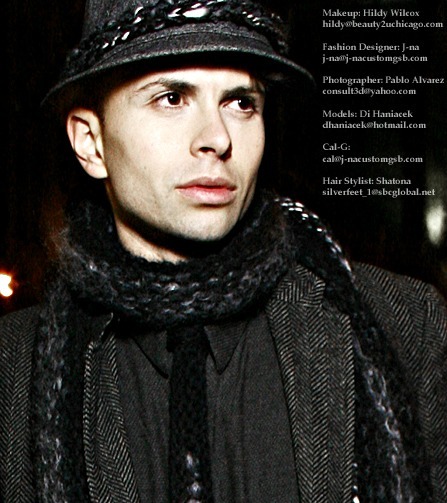 Haute couture scarves takes a man beyond distinguished or dapper, to resonate customization that equates success, and confidently expresses his own distinct personality and qualities. Haute couture scarves for men just blow people away, because they are so used to seeing the same plaid Arab scarves trend for the last four years, and boring solid or stripped cashmere. 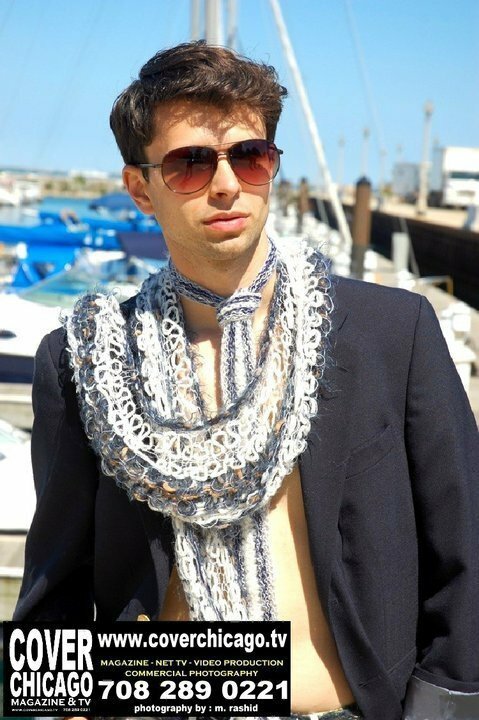 Given, I would rather see a guy in one of those scarves, rather than no scarf at all, because if it compliments his look well, it is enough to communicate fashion forward or distinguished handsome. Any man that thinks enough of himself to venture into the realm of accessories deserves a pat on the back in my book for a job well done! Don't focus just on what is trendy or HIP, focus on what is really you, your best concept and personal style, because when you are authentically YOU, well that is HIP! But with haute couture scarves it’s all about taking things beyond the ordinary to the extraordinary, and with men’s couture we go to another level still! Let’s review, haute couture means custom clothing, and in accessories and haute couture scarves that means you get a scarf designed just for you in the size, colors, styling that best suites who you are, that you can reserve for just one amazing look, or you can make it versatile, so you can wear it with everything if you choose. The point is that you pick it. Click here to customize the perfect couture scarf for YOU! Click on images to see a slide show of the haute couture scarves. 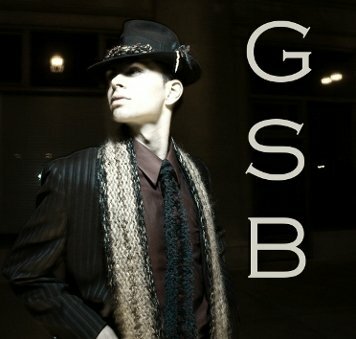 Here are some ideas from GSB our men’s line on what you can do with haute couture scarves, all of these scarves are only models keep in mind, no two are made the same, you tell us what and how you want it. It’s custom in every way. For the up-and-coming stars of their fields custom accessories are the way to go, much more affordable than custom clothing and very versatile. 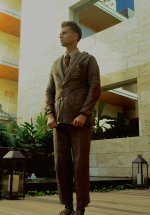 You can wear and combine them to be seen by a much more extensive audience than a custom suit or shirt that you can only wear every so often. You are advertising you, everywhere you go, and smart business men want to get the most exposure, with projecting exactly what you want to say as your message. You are your most important message, make your accessories custom, in tune with your authentic self. If a guy is already fabulously wealthy and already wears a custom wardrobe, then he obviously wants the best detailed custom accessories that compliment that, right? See all the ways you can wear and style this GSb Signature Fur Stripe on a fine wool and silk couture scarf. GSb stands for give some back! Every time you dress in custom clothes that reflect who you truly are you give others the permission and empowerment to truly be who they are! 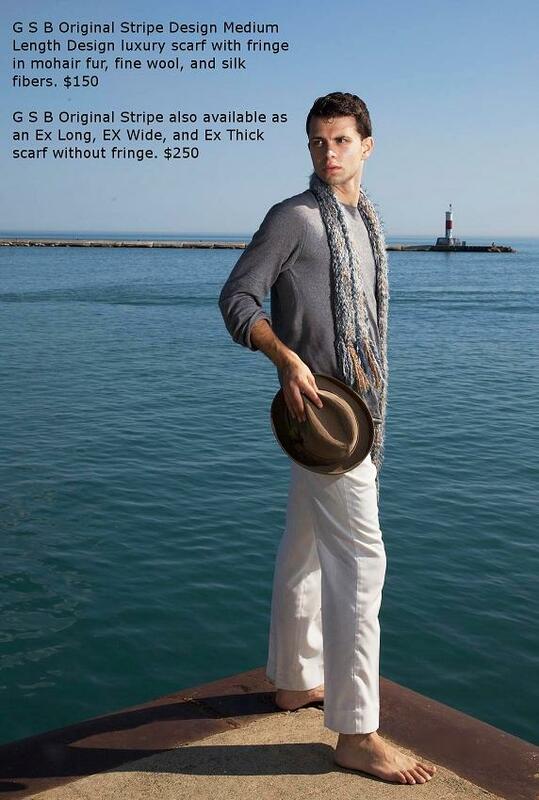 Or Wear it traditionally over a long camel hair overcoat. Be bold! Wear it with no shirt at all skiing in Aspen! If attention is what you are craving, that will work! Wear it with a matching unique couture vest or sweater! Wear it over a store bought boring sweater to spice it up and add personality! In true couture, you have something that is handmade for you, that is what you are paying for, we think that if it is handmade it should look like it! Notice the stitching on our scarves, the vast majority of scarves you see out there on the market are machine made, they look mass-produced! 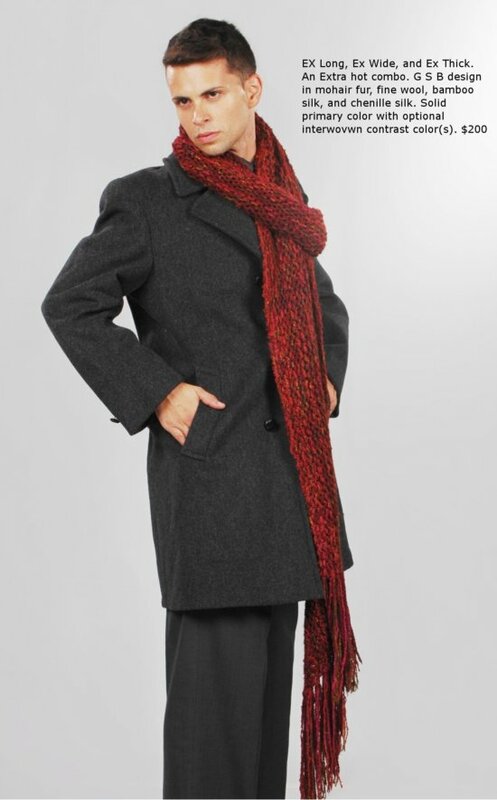 See how the scarves combine with the look and wardrobe, they are the center point, not the ascent! The scarf commands the look! Have you seen this concept before? See the rich texture used on GSB scarves? Mohair, soft, durable, life is better in 3D, add luxury! We are not talking about the acrylic plasticy scarf that your grandma crocheted for you when you were a boy, we are talking about handmade large stitching professionally done, in high-end silks, mohair, cashmere, and alpaca, in designs that folks have never seen before! A thing admiration worthy that will get you the attention and respect you deserve. Is that a classy idea or what? Click here to customize your haute couture scarves!